Everton’s meeting with Aston Villa on Saturday comes at a time of financial crisis for the Goodison Park club. They’ve sought but cannot find any new investment. (See now notorious transcript of fans’ meeting with Bill Kenwright). They needed to sell in the summer transfer window in order to buy – but didn’t have enough time to buy after shipping out Mikel Arteta to Arsenal at the 11th hour. They’ve been way off the pace behind the Premier League’s big guns in terms of net spending in recent times. (NB: this was a week before the window shut but still remains true when considering the gulf between the genuine title contenders and Everton). And financial constraints mean they’ve also lagged behind the real contenders in what they’ve been able to spend on salaries. 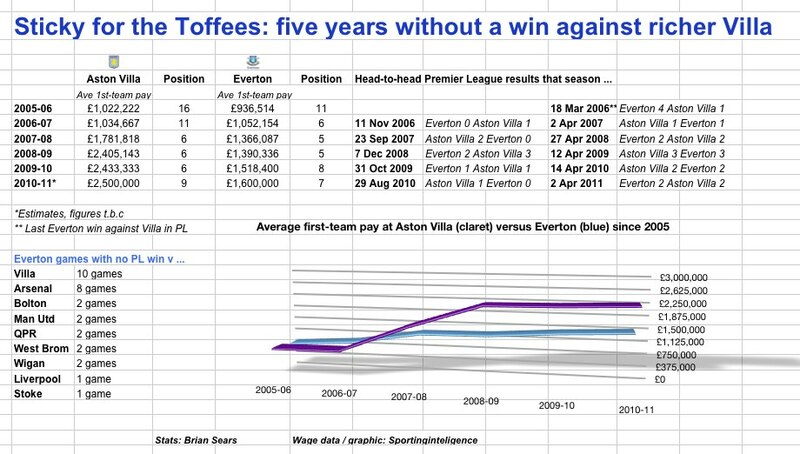 Our graphic below, for example, shows how Everton’s average first-team pay has been smaller than at Aston Villa in five of the last six seasons. Villa are a club with similar aspirations to knock on the door of the big four / five / six. Having said that, Everton with their smaller resources have still finished higher in the Premier League than Villa in five of the six past seasons, almost certainly because of the stability within the manager’s office and the hard work and skills of David Moyes. And yet there is still a head-to-head anomaly in the fixture between these clubs over the past five seasons. Everton are winless against Villa in the Premier League, home or away, since March 2006. McFadden, Cahill (twice) and Osman scored that day, while Agbonlahor replied for Villa. Everton at least manage a win from time to time against all-comers – they have league victories over Manchester United, Chelsea and Liverpool for example in the last one and a half seasons. Equally Aston Villa manage to get beaten by all other clubs fairly regularly. But Villa visit Goodison this weekend in the knowledge that they have not lost a single league match to the Toffees for a 10-game stretch. The only other team Everton have found it (almost) as hard to beat in recent times are Arsenal – no win against them for the last four seasons. One other thing to consider if the five-year form book is maintained and Villa are still riding high come Monday – Villa are enjoying the cushiest set of opening fixtures of all 20 clubs.